New Games on Demand were released 9/10/10. (Online Interactions Not Rated by the ESRB) Download the manual for this game by locating the game on http://marketplace.xbox.com and selecting “See Game Manual”. In Shadowrun™, vie for supremacy in an intense first-person shooter (FPS) experience that rewards cleverness, cunning, and split-second improvisation through a unique combination of modern weapons, ancient magic and advanced technology. 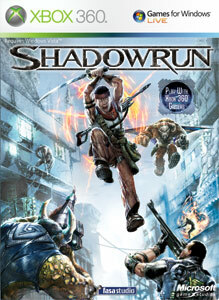 FASA Studio, the creative minds behind MechWarrior® and Crimson Skies®, and John Howard, lead designer on Halo®, are back with Shadowrun, the new multiplayer FPS based on the much-beloved role-playing game (RPG) franchise. There are no refunds for this item. For more information, see www.xbox.com/live/accounts.